Congratulations to Dan Smith, Winner of the $100,000 Challenge (A$ 1,012,000)! Dan Smith - $100,000 Challenge Champion! The 2012 Aussie Millions $100,000 Challenge has wrapped up after two exciting days of poker up in Studio 3 at Crown Casino in Melbourne, Australia. The lion's share of the $2.2 million prizepool (A$ 1.012 million) has been awarded to Dan Smith after he defeated Mikhail Smirnov heads up for the title. 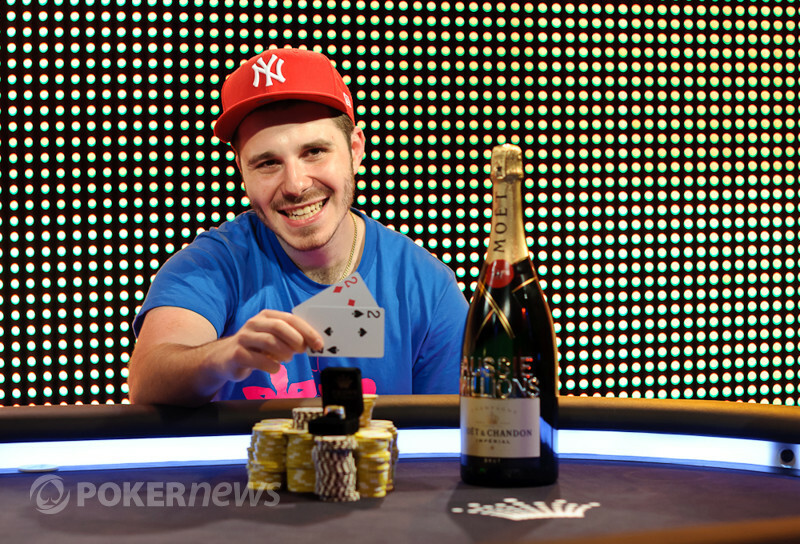 For his runner-up finish, Smirnov took home A$ 616,000. The second six-figure buy-in of the year kicked off yesterday with 22 players taking command of 100,000 in starting chips. At the end of Day 1, the field had been whittled down to the final table of eight, but no one was guaranteed any money just yet. On Day 2, four more players hit the rail — Nam Le, Sam Trickett, Sorel Mizzi and Gus Hansen — without making any money as only the top four spots were being paid out. Hansen proved to be the bubble boy of the event after a wild, roller-coaster ride and was the last to go home empty handed. Finishing in fourth place and earning A$242,000 was Tony G. He fell at the hands Smith when his couldn't outrun the for the eventual champion. Then in third place it was Joe Hachem who exited, earning A$330,000 and his largest-ever live tournament score in his home country of Australia. Hachem got the last of his money in with the against the for Smith. Although the 2005 World Series of Poker Main Event champion flopped a nine and turned trips, Smith resucked on the river by making a spade flush. Quickly into heads-up play, Smith found a big double through Smirnov when his held up against the for his Russian counterpart. Smirnov battled back, though, and things became a pretty evenly matched tug-o-war battle for a long while. Eventually, after several swings back and forth and exchanging of the chip lead, the final hands came up during the 15,000/30,000 level. First, Smith took a very, very commanding lead when his pocket sixes held up against the for Smirnov. Then on the final hand, Smith eliminated Smirnov in second place with pocket deuces. The ducks held up against the for Smirnov and that was all she wrote. For Smith, this is easily the largest win of his career. It's also the largest score of Smirnov's career. Both players achieved great accomplishments today and deserve much respect. The battle was long and hard, but Smith has emerged victorious and can now add a cool seven figures to his bank account. For us at PokerNews, we're calling it a night, but our 2012 Aussie Millions coverage will continue tomorrow so be sure to return right back here for that. Mikhail Smirnov got his last 180,000 chips in with , and Dan Smith was content to flip for the knockout with his mighty . The flop was nice and tidy for Smith, but the turn gave Smirnov another four outs to make Broadway and find the double. But he could not. The river was clean, too, and that's the final river card of this event. 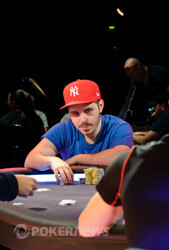 Unable to get over the hump, Mikhail Smirnov has been eliminated as the runner-up, earning himself A$ 616,000 as a consolation prize. It was a mighty battle, but it's Dan Smith who got the best of it in the end. "All in and call!" was the announcement from the final table, which brought everyone up in Studio 3 to their feet. 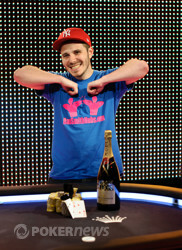 Dan Smith was all in preflop with the against the for Mikhail Smirnov. The flop came down and the sixes for Smith held up so far. The on the turn gave Smirnov some more outs to win the hand as he could no counterfeit the sixes of Smith if a nine fell. The river was the big ol' and just what Smith wanted to see. He was able to fade the outs of Smirnov and double through. After the chips were counted, it was determined that Smith was all in for 1.01 million in chips. That now gives him a big strangle hold on this match. 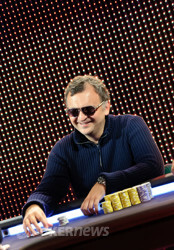 Mikhail Smirnov raised to 75,000 to open the action, and Dan Smith defended his big blind to see a flop. It came . Smith check-called another 85,000, and they both checked through the turn. On the river, the cued Smith into action with a bet of 180,000. Smirnov let out a heavy sigh of disapproval before sliding the call into the pot. Smith tabled for queens with a nine, and Smirnov suddenly liked his hand a lot better. He turned up , and his kicker earns him the pot and about a 2:1 chip lead once again. The cards are back in the air. From the button, Dan Smith limped in. 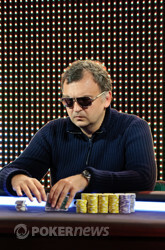 Mikhail Smirnov raised to 69,000 from the big blind and then Smith came back with a reraise to 154,000. Smirnov called and off to the flop they went. The flop produced the very connected and both players checked to see the get added on the turn. Here, Smirnov bet 125,000. Smith took all the allotted time he had and then made the call at the last possible second. The river completed the board with the and both players quickly checked. Smirnov tabled two pair with the and Smith mucked his hand.